Glenn and his mother Marjorie could not be happier with the transformation to Glenn’s accommodation, from the tiny ill-equipped bungalow in the back yard to a fully self-contained flat and accessible bathroom, joined to the house with a spacious deck. When the Glenn and Marjorie were informed they could spend some insurance money to build Glenn a bigger room, they didn’t really know what to ask for, and left most of the detail in the hands of their home modification project manager from Architecture & Access. The deck has made a big difference by connecting the flat to the house and providing a covered outdoor space for the Glenn and Marjorie to enjoy together. 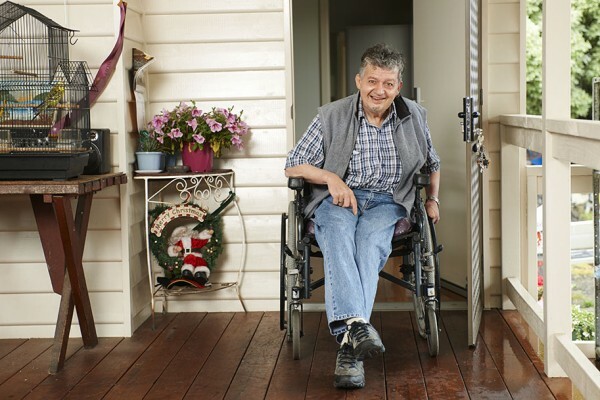 Previously, in order to get into the house, Glenn had to come out of his bungalow down the concrete ramp in his wheelchair, across the yard at the mercy of the weather and up another ramp to the back door. They were in good hands with project manager Mary Younger, a qualified architect with over 20 years in private practice and senior roles providing architecture and home modification services to people with disability. In designing and delivering individual home modifications, she draws on the expertise of the wider team at Architecture and Access including access consultants, occupational therapists, landscape and interior designers. A garage with an undercover connection to the ramp is due to be installed soon. See pictures of Glenn’s home modification in the Project Gallery.